Over the last century, women have been represented in U.S. popular culture primarily as harem girls, belly dancers, and oppressed veiled women. According to Amira Jarmakani in Imagining Arab Womanhood, the veil, the harem, and the belly dancer are cultural mythologies that purport to represent the realities of Arab and Muslim women through sweeping generalizations that rob these women’s experiences of their diversity and historical context. She claims that these images masquerade as accurate portrayals of Arab and Muslim women’s lives. Veiled women and belly dancers are two sides of the same coin. On the one hand, belly dancers code Arab culture as exotic and sexually available. Portrayals of Arab women as sexually available position them as existing for male pleasure. On the other hand, the veil has figured both as a site of intrigue and as the ultimate symbol of oppression. As a site of intrigue, the veil has been represented as a forbidden zone that invites male penetration. As a symbol of oppression, the narrative about the veil is powerful and comes in many forms – such as stories about “honor” killings, female genital mutilation, forced marriages and forced veiling. These stories have been circulated and consumed with such frequency that Arab culture and the religion of Islam have come to be seen as inherently oppressive to women. De-veiling and liberating oppressed women have become part of the American cultural imagination. 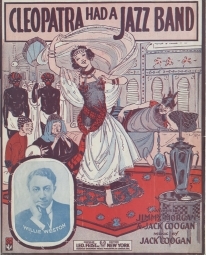 Cleopatra Had A Jazz Band sheet music, c. 1917. William and Elsie Peck Collection. Bratz™ Genie magic dolls, MGA Entertainment, 2006. Bratz dolls are an extremely popular franchise aimed at 9-12 yr old girls. These dolls are another example of the Arab woman being portrayed as a seductive belly dancer and marketed for popular consumption. Image from Aladdin, animated feature, 1992, Walt Disney Studios, courtesy of Joe Namy. Disney’s Aladdin was widely criticized by Arab Americans forits violent and inaccurate portrayal of the Arab World. The dancing girls in this scene are examples of seductive, veiled dancers. Edward Aarons’ Assignment – The Cairo Dancers 1965, a spy/thriller novel. Published by Fawcett Gold Medal. The cover art depicts two scantily dressed Egyptian women dancing in front of a desert scene. Jonathan Friedlander Collection, Special Collections, Young Research Library, UCLA. Nile Empire: War in Heliopolis, 2002, player’s handbook. Published by Avalanche Press. Cover image depicts a voluptuous and scantily dressed Egyptian warrior princess with carved hieroglyphics and pyramids behind her. 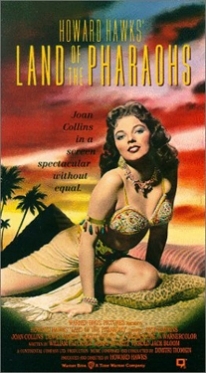 Land of Pharaohs, VHS cover, 1955 Warner Brothers Pictures. Joan Collins stars as a princess in this epic film, who has to offer her body to a powerful pharaoh to save her people’s lives. Jonathan Friedlander Collection, Special Collections, Young Research Library, UCLA. Still from the film Arabian Nights, 1942, Universal Pictures, courtesy of Joe Namy. The film is one of series of “exotic” tales released by Universal during the war years. Others include Cobra Woman (1944), Ali Baba and the Forty Thieves (1944) and White Savage (1943). The women are not only solely portrayed as seductive veiled dancers, the Arab World is portrayed with inaccurate geography – notably, including the Taj Mahal. “DISTINCTIVELY INDIVIDUAL—ANYWHERE. Anywhere? Yes, indeed, but most especially in the urban areas along the US’s Eastern Seaboard. 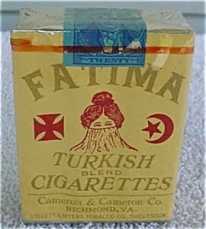 Before the First World War, Fatima was America’s best selling 15 cent Turkish blend cigarette. Fatima Cigarettes advertising targeted men who loved adventure and who appreciated technology’s cutting edge. Ads published in Scientific American Magazine pictured male smokers who wanted to fly, work the jungle outposts, or be a ship’s radio operator. These were the guys who marveled over the science of moving pictures, building the Panama Canal, or that new Marconi wireless radio being used aboard ships such as the Titanic.” From James A Shaw, Copyright 1998-2007, http://jimsburntofferings.com/adsfatima_brown.html Fatima cigarettes, Liggett & Myers (L&M), 1913. Arabian Woman with the Yachmak. From Alloula, Malek, The Colonial Harem. Minnesota: University of Minneapolis Press, 1986. From Alloula, Malek, The Colonial Harem. Minnesota: University of Minneapolis Press, 1986. In My Harem by Irving Berlin, Waterson, Berlin, and Snyder Co., 1913. William and Elsie Peck Collection. Rama and Her Friend by Flickr user Héctor de Pereda released under Creative Commons License Attribution 2.0 Generic. Arab American women, 2008. 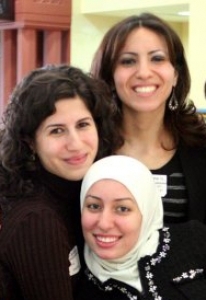 Lama Mansour, Jumana Salamey, and Nadia Bazzy. AANM collection. Afifa Karem, first well-known Arab American female journalist. Wrote for Al-Hoda, The Syrian Woman, and The New World in the early 1900s. Much of her writing argued for the rights of Arab and Arab American women. AANM collection.